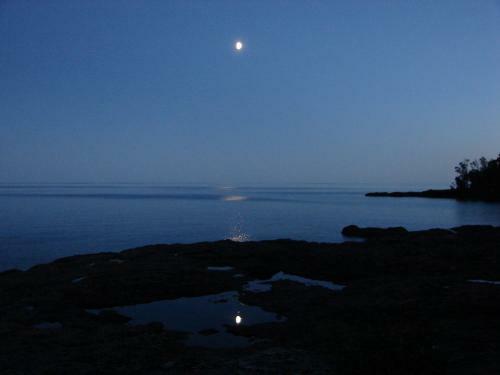 On Friday August 8th Becky mentioned she had not been to Lake Superior in over a year. Since she and I have a history that the Lake plays a central role in, from the first time we hung out onward, this was a call to action. I suggested we get up there soon, she said ‘how about this weekend? She had to work Saturday, so I last-minute emailed my boss and managed to get Monday off of work. We left early Sunday morning without any semblance of any plan at all whatsoever other than that we would go to the Lake in the Riviera, and we’d be bringing Cleo with. Other details were irrelevant. We shared the vague idea that we’d get a cheap motel room somewhere, but didn’t even know which side of the lake we’d be traveling. The trip up was beautiful. 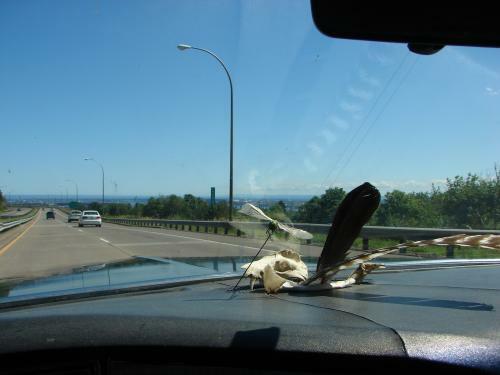 We started with a run through the coffee shop drive-through and then hit the highway. The Riv ran great, the iPod’s shuffle delivered perfect tunes over and over – twice playing a song I had just declared that I wanted to hear within a few tunes, out of 4,000, (a Marley medley I mentioned to Becky, and the James Brown-screamy Keleya), and seeming to play a lot of extremely appropriate songs. OK, so what I’m trying to say is things felt comfortable and right and kept building til they were pretty much magical. I can’t explain it now cause I cant truly feel it now, but I know it was real, and it mattered. We were “in the Flow,” as some say. 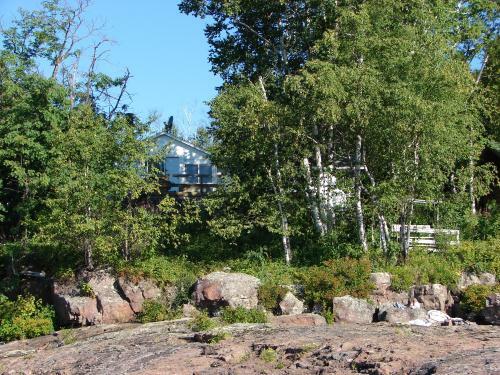 After lunch in Grand Marais, we started southwest back along the shore, hunting for a cheap motel with some character. After striking out at several no-vacancies, we let ourselves be swayed into a $200-a-night cabin – but then we were shot down by a 2-night minimum rule. But now the motel hunt had switched to cabins – they might cost twice as much, but having a firepit would make it worthwhile. Well, as it turned out there was only one cabin available along the whole shore, and after very nearly missing it, we got it – and it was goddamn amazing (not to mention cheaper than the inland Lutsen cabin would have been). Cozy, a beautiful view of the lake, a huge porch, fire pit right on the lake’s rocky shore … it couldn’t have been better in any way I could think of. We immediately made a mad dash into the nearest town to get some food to grill (racing against the setting sun and the early closing times out in the middle of nowhere on a Sunday night). 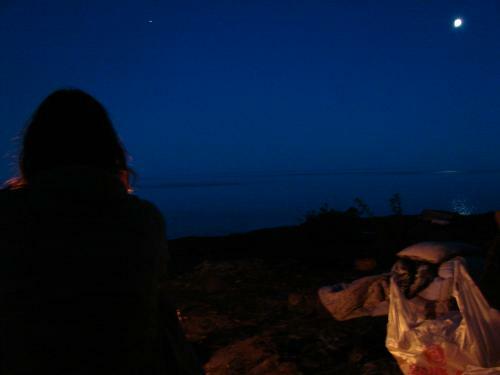 We got back to the cabin just as dusk settled in and the sky turned deep, deep blue. The fire burst into a roar within seconds, and Cleo got to work trying to catch waves – her favorite hobby. Then, as I made a return trip through the patch of woods between the cabin and the rocky shore, I was suddenly hit with a powerful wave of something like déjà vu. 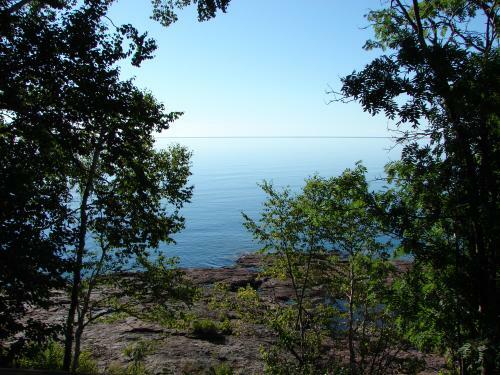 I had stayed at a cabin on the Superior shore one time in my life, with my family twenty years before. Two memories still stuck with me from that trip – that I’d lost a frisbee to the waves – and that there had been raspberry bushes on the side of the cabin. My sister and I had eaten handfuls of them. I had no idea why I said that, or why I had suddenly had a flash of some kind of certainty that this cabin would also have raspberry bushes growing on the left side of it, just as the cabin in my childhood had. I marched through the woods, Becky bewildered behind me, up around the corner of the cabin – and aimed the flashlight on the two bushes I found growing there. The ripe red raspberries in the flashlight’s beam dropped both my jaw and my rationalist defenses. The rest of the night felt like a surreal dream. While it would have been really weird if we’d wound up in the same cabin as the one from my childhood, it was even weirder to be in a totally different cabin, become bizarrely convinced that there would be raspberry bushes on the side – and be right. Why was I struck so hard by the conviction that there would be raspberries growing on the side of the cabin? Why was I right? What could it possibly mean? I had a million questions with no answers, just an irrational notion that perhaps it was more of ‘the Universe’ (for lack of a better term) telling me that things were good, that intuition could be trusted, that magic was real. I started to feel like I was tripping on a psychedelic, physically and mentally. When I realized Cleo was limping and found that all her feet had been pretty badly abraded by the rocks and her relentless efforts to capture a wave, I had no choice but to find in this a metaphor – comparing her wave-hunting to my ‘Truth quest’ – futile, compulsive, joy-bringing. Becky and I roasted marshmallows and brats on clothes hangers, watching the fire, the water, and – once the fire had turned to embers – the stars. Eventually Cleo had to be leashed by the fire, to make her rest her wounded feet. 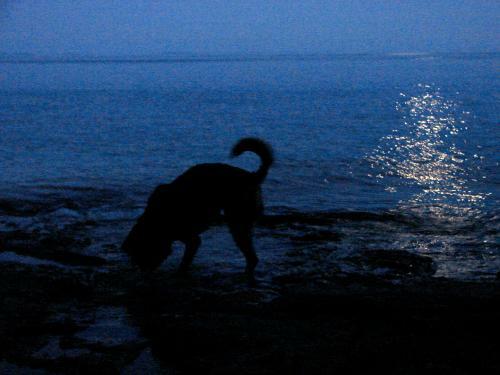 Every time that the waves crashed a little louder, she would raise up and whimper quietly … even though her paws were shredded and she never managed to capture the waves that seemed so tangible as they rolled in, she just couldn’t help but want to chase them anyway. And although my mind felt as battered as Cleo’s feet, I couldn’t help but keep trying to make sense of a reality that I would never quite grasp.